On June 5th-6th 2012, Venus will pass right in front of the sun, a rare predictable astronomical phenomena, the last transit of Venus in our lifetimes as it will be the last time this century, and is not predicted to happen again until December 11th, 2117! Normally, Venus is either above or below the Sun, as viewed from the Earth and only crosses in front of the face of the Sun every 100 -120 years, when two transits occur together, 8 years apart. 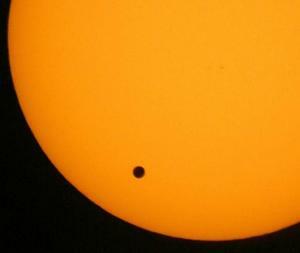 The last Venus transit took place in June 2004. During the transit, the planet will be seen as a small, black dot moving slowly in an East-to-West direction across the Sun. French time, allowing us a maximum of 55 minutes of observation. The association « 450 000 années lumière » in Tautavel invites you to observe the phenomenon with them at the parking at the Hermitage of Força Réal, on June 6th from 5h30 It is free. On-site astronomers will guide you to discover the sky and answer your questions. .. WARNING: Never look at the sun directly without a safe filter in place to protect your eyes. Do NOT use sunglasses, x-ray film etc. Check with an optician for more information.